This Oak wide board engineered wood flooring has a smoked oak wear layer which has been prefinished with hard wearing hard wax oil. This 6mm smoked Oak top layer is bonded onto a timber plywood backing, making this floor extremely stable. Because this hardwood flooring is engineered in this way, it is suitable for laying over underfloor heating, directly to the existing concrete or timber subfloor or with its structural 20mm thickness, spanned over floor joists. Something else that should be taken into account, due to the 6mm thickness of the top hardwood wear layer this engineered wooden flooring has the same longevity as a solid wood floor, but without the stability issues. 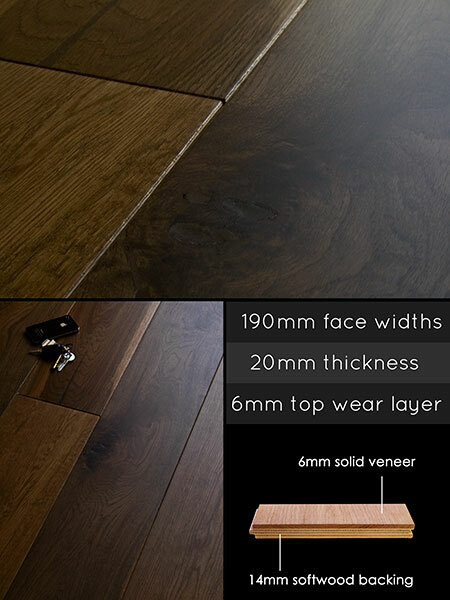 Width 190mm x 20mm thickness. * Oak 6mm top layer. * Same longevity as a solid wood. * Prefinished for clean installation.